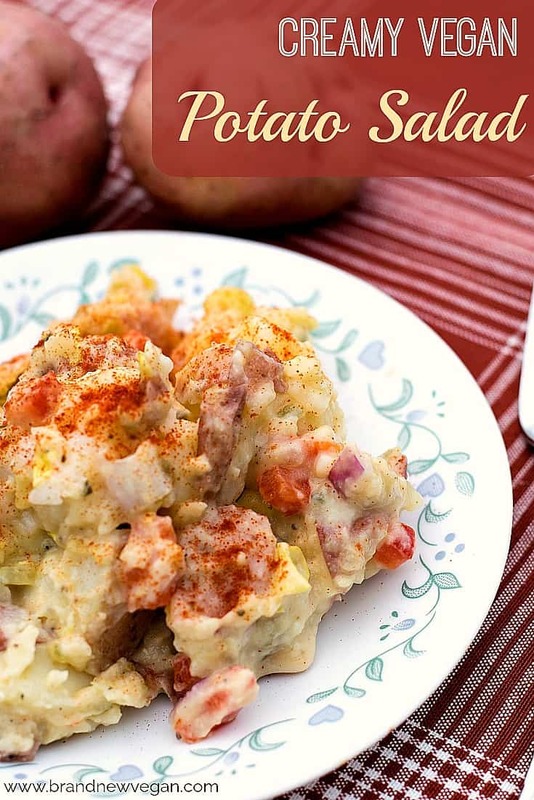 With summer right around the corner, I knew I was going to have to come up with a decent Vegan Potato Salad Recipe….you know…. to go with those awesome Beer Brats and Baked Beans of mine. Well I think I got it – and the secret is in the sauce. And there’s obviously NO mayo either. So what did I use to make it so creamy? White Cannellini Beans to be exact. I basically used my White Bean Mayo recipe from my Vegan Turkey Salad recipe to make homemade Potato Salad, and it turned out WONDERFUL! 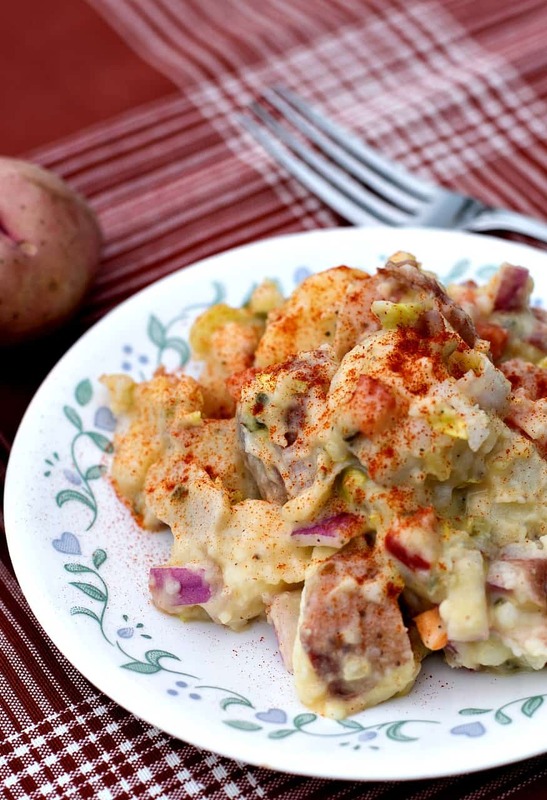 Smooth and creamy Vegan Potato Salad, PERFECT for those summer picnics. You’re going to need 6 medium-sized Red Potatoes. Give them a good scrub and then cube them into large chunks. If you have an INSTANT POT, you can add the steam trivet that came with your IP to the bottom of the pot, and then add your potatoes along with 1½ cups of water. Set it to MANUAL and cook for 4 minutes. For the stovetop version, boil the potatoes in just enough water to cover them, for about 5-10 minutes or so. Just until they are fork tender. Now drain off the water and immediately set the potatoes aside in the refrigerator to cool while we make the rest of the salad. In a large bowl chop 2-3 ribs of celery, a ¼ of a Red Onion (or more), and about ¼ of a Red Bell Pepper. Now add 2 heaping tablespoons or so of Dill Pickle Relish and stir to mix. Set this aside and let’s move on to the dressing…. Empty the can of beans into your blender – JUICE AND ALL – and then add all the remaining ingredients for the dressing and blend until smooth and creamy. Add your cooled potatoes to the salad bowl and gently stir to mix everything together. Finally, using a rubber spatula, carefully fold about 1 cup of the dressing into the salad and mix until everything is blended. Note: The recipe will make about 2 cups of dressing so you can use the remaining dressing on whatever you wish – or for super creamy potato salad you can use the whole batch. Chill for 30 minutes or so, adjust any seasonings if needed, and garnish with a dusting of paprika. Mmm summertime potato salad, with hardly any fat. PERFECT. Hope you enjoy and be sure and keep those comments coming! A smooth and creamy Vegan Potato Salad without using any mayo, tofu, or nuts. The secret is in the sauce! INSTANT POT: Add your steamer trivet to your IP, the potatoes, and 1 1/2 cups of water. Set to MANUAL and cook for 4 minutes. STOVETOP: Add the potatoes to a large pan and cover with water. Boil until just fork tender - 5-10 minutes. Note: The dressing makes about 2 cups - I would start with just 1 cup of the dressing and add more if necessary. Use the remainder as a salad dressing or mayo substitute. ooh, can’t wait to try this one! 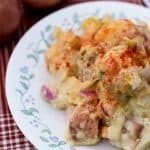 So hard to find a no-added-fat potato salad! So about 2.75 pounds of potatoes Chuck? Thanks so much for offering your recipes for free! I tried your fries and they were amazing. Can’t wait to try the potato salad! This looks yummy! Can’t wait to try it. Just ordered your books, you recipes sound DELIGHTFUL… and I really need some that are TRULY GOOD. Thank you! I have been looking for a soy free mayo, that also didn’t have nutritional yeast in it. I can’t wait to try yours, with the addition of a chipotle pepper… yum! I would never have thought to use white beans as a sauce! I’m excited to try this sometime soon over the summer. My vegan potato salad uses olive oil and red wine vinegar, so I’ll be curious to taste this one! Putting together a *good* potato salad – even one with all the traditional ingredients – is a real trick. (Soooo many bad potato salads out there.) But making a good vegan one: color me impressed! Thanks for making it soy-free, by the way. I’m not fond of potato salad, so what else would you suggest the sauce would dress up well? It seems like it would be yummy. I also have a pasta salad using the same dressing…. or some people just use it as a mayo for sandwiches. I bet it would be great as a coleslaw. Sprouts has a great pre-shredded broccoli slaw that I love. Last I checked, Tahini is a condiment made from toasted ground hulled sesame seeds. It is not a highly processed oil. Wow. Tahini is not oil, any more than almond butter is. It IS fat, but a whole food fat. Definitely not worthy of such a mean post. can I make it without the tahini? I did, and it’s still delicious! Wow, this is good! I don’t like celery so I doubled the onion and bell pepper. Also, I used pickled jalapeño in place of relish for a kick. This is crazy delicious. I’m so glad I moved from just being a vegan to the WFPB-NO diet. I probably never would have tried this otherwise. I’m SO glad I did! Just made this for tomorrow’s lunch. So good! (Had a little taste test. Gotta restrain myself!) I left out the tahini. I also put the celery seeds in separately so I could use the other half of the dressing as a mayo, which I am super excited about too! Thank you so much! Great flavors; even my ‘meat and potato’ husband thought it was yummy and he’s all about the mayo. Just made this for a summer lunch with corn on the cob (we just boil the corn on the cob and eat it like that…sweet and yummy),. It tasted very good! My husband and I have been WFPB NO for a year now. 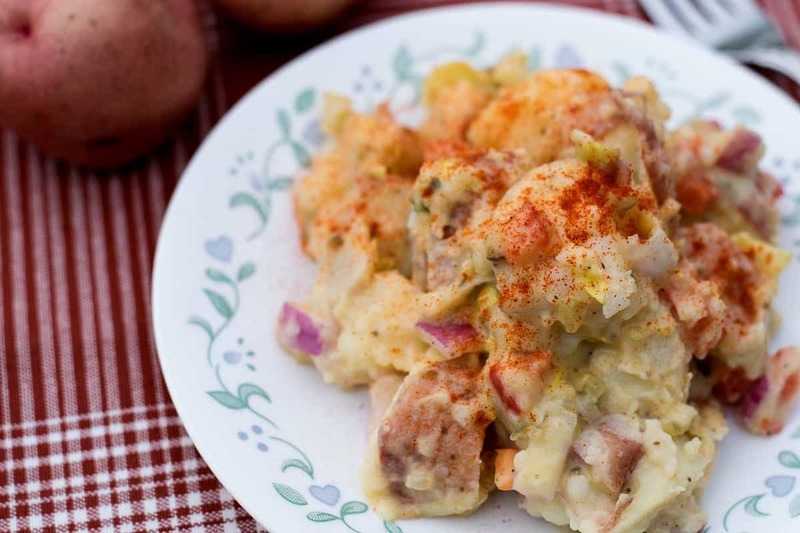 He’s missed his potato salad, so when I found this recipe I had to try it for him! I didn’t have Tahini so didn’t use it. We don’t care for the celery, so I didn’t use that. I thought it would be a little creamier than it ended up, but the flavor was spot on! DELICIOUS! Thank you so much for sharing this! Thanks for a great potato salad recipe! I left out the sweeteners and added some yellow mustard and a little apple cider vinegar to the mix. I made about 4 lbs of potatoes so l used the entire batch of dressing on it. It was so good! The whole family ate it up. So good and creamy and was even better the next day. Keeper dressing recipe will be delish on pasta salad too. Just wonderful! Best potato salad ever. You’ll never miss the mayo. I tried this for Labor Day weekend – it is excellent!! More crunchy veggies than I used to put in potato salad, but the texture and dressing were perfect. Thanks for helping to make the transition to plant based eating easier. I was out of pickle relish so I chopped up some pickled jalapenos and that worked just fine!